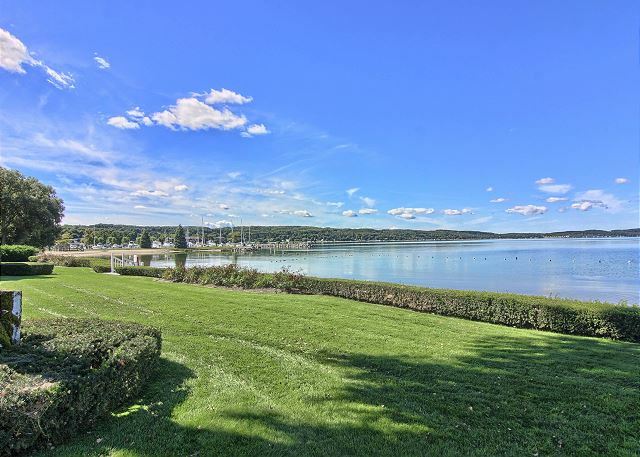 Suite 114 is a ground floor suite, completely remodeled and tastefully decorated, with breathtaking views of Lake Charlevoix. This unit offers one bedroom with a king size bed and one bathroom with a walk-in shower. Suite 114 has a kitchenette all ready for in-suite meals, a dining table, and living room featuring a queen size sofa sleeper, gas-log fireplace, and flat screen TV. The sliding glass door opens to a private patio that offers direct access to our private beach. very relaxing, quiet, and nice. Loved this beautiful condo! We were able to open our patio door and were 10 steps from the beach. Perfect if you have kids! We we in Boyne City for one night only. The condo was nicely decorated, clean, quiet, had a beautiful view of the lake and located exactly where we wanted to be, close to downtown Boyne City. Be aware, though, they turn the fireplace off in the summer months, so if you're wanting to snuggle up in front of a fireplace on a cool summer night, it won't happen here. Other than that, we could not have asked for anything better. Stayed here before. Great location and quiet. Easy walk to restaurants, bars, etc. Short drive to Charlevoix or Petoskey. Great Experience! We drove up from Grand Rapids for a wedding in Charlevoix and we were welcomed into a very clean condo with amazing views of Lake Charlevoix. My in-laws joined us and we all want to come back! 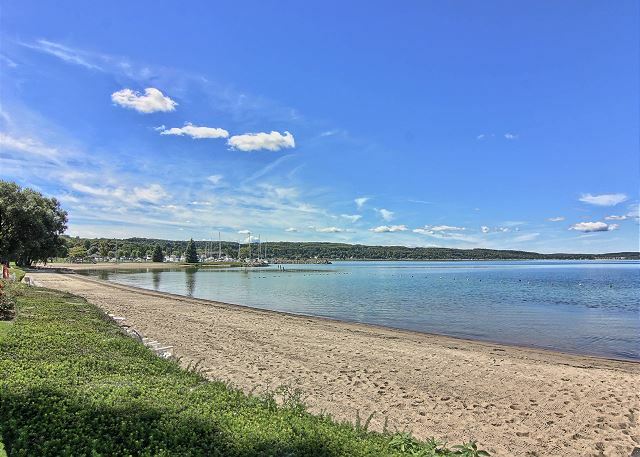 This is the perfect location for day trips to Charlevoix, Petoskey, even Mackinac City. Plus, Boyne City is so cute and there's plenty to do right in town. We will be back! Fantastic!! We all agreed we'd like to rent again next summer. The room was clean and tastefully decorated. Staff were helpful and kind. They even had a lending library of movies on a rainy day! Beautiful, well maintained beach, great little town. Great condo with excellent beach area. Really enjoyed staying on the lake and watching the beautiful sunsets. Water street in is a wonderful property over all ! Perfect location and fantastic water views ! Unit 114 was nice but other units are more comfortable . The king size bed needs some memory foam as it and pillows much too firm. This units been moderately updated and has a nice look . This is a GREAT place to stay, I can't say enough good things about the people. Nicole and Theresa are the best. We stay here every time we go to Boyne, which is often and we love it.